Whenever Barack Obama got away from the White House, you could often find him on a local gold course. When President Donald Trump got away to his Florida resort over the weekend, he was busy working, spending time with the Prime Minister of Japan and meeting with his top aides to discuss national security issues including the latest ballistic missile test carried out by North Korea. President Trump and his top aides coordinated their response to North Korea’s missile test on Saturday night in full view of diners at Mr. Trump’s Mar-a-Lago resort in Florida — a remarkable, public display of presidential activity that is almost always conducted in highly secure settings. 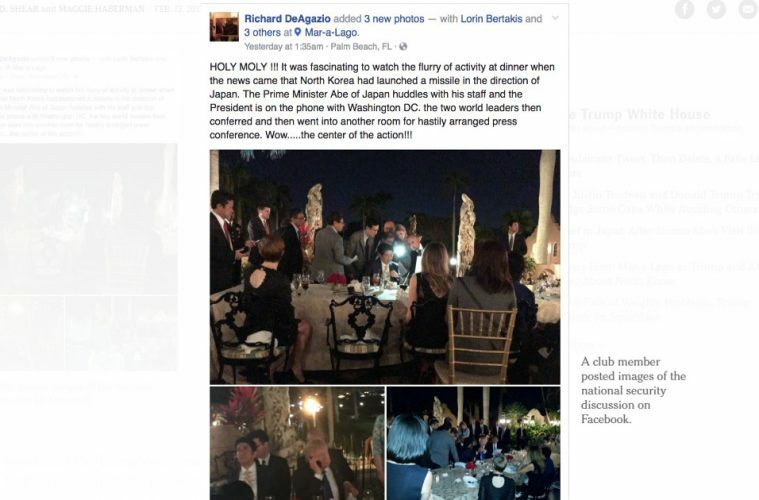 The scene — of aides huddled over their computers and the president on his cellphone at his club’s terrace — was captured by a club member dining not far away and published in pictures on his Facebook account. The images also show Mr. Trump conferring with his guest at the resort, Shinzo Abe, the Japanese prime minister. Shortly before Richard DeAgazio, a new member of Mr. Trump’s club, snapped the pictures, North Korea test-fired a ballistic missile into the sea off its eastern coast. Mr. DeAgazio posted his pictures to Facebook as the two leaders and their staff reviewed documents and worked on their laptops, using cellphones as flashlights.